CHAIRMAN: Before taking up today’s evidence, ladies and gentlemen, which will be preceded by an Opening Statement from counsel in the usual manner, I should refer briefly to the matter that has arisen in recent times. In these sittings, the Tribunal had hoped to continue with the evidence of Mr. Charles Haughey. This has not proved possible, as has been recently mentioned. This is due to Mr. Haughey’s medical condition as reported to the Tribunal by his legal advisers. I have been considering the matter with the assistance of my legal team and have made arrangements to obtain medical advice from an appropriately qualified expert. I expect to be able to determine how I should proceed in this matter sometime within the next one to two weeks. At that stage, I also hope to indicate how the Tribunal proposes to bring all of its work to a conclusion. I expect to be able to lay out, in general terms, the Tribunal’s plans between now and the completion of the taking of evidence, which I anticipate will bring us into a date in the early part of the new year. 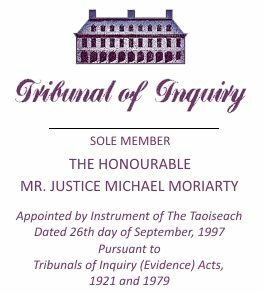 MR. HEALY: In these short sittings, Sir, the Tribunal intends to deal with a number of disparate matters, all of which relate to evidence which has already been given. Firstly, the Tribunal will be dealing with new evidence relating to the operation of the Leader’s Allowance account, with particular reference to the use of that account in connection with the funding of the late Mr. Brian Lenihan’s medical expenses. This will involve the evidence of Mr. Philip Monahan, Mr. Roy Donovan, Mr. Paul Kavanagh and Mr. Frank Lynch. Next, the Tribunal will hear evidence of Mr. James Stafford in connection with his involvement in setting up the company now known as Minmet and then known as Feltrim, a company promoted by Mr. Conor Haughey. Thirdly, the Tribunal will be dealing with one aspect of the operation of Celtic Helicopters. This will involve the evidence of Mr. Joseph Malone. The Tribunal has already heard evidence from Mr. Malone in connection with his involvement in the funding of Celtic Helicopters and his dealings with Mr. Charles Haughey in relation to that company. The Tribunal has obtained further information from Mr. Malone and initially it is envisaged that this information will be introduced into evidence in the form of an affidavit. In due course, the Tribunal envisages that further evidence will be given by Mr. Malone at its public sittings, but it has not been possible to arrange for Mr. Malone’s attendance to give this evidence during these short sittings. Also, at some point, hopefully next week, evidence will be given by Mr. Tony Traynor concerning his knowledge of his late father’s dealings of Mr. Haughey. During these sittings, the Tribunal will also be dealing with one or two matters left outstanding in connection with the Central Bank’s dealings with Guinness & Mahon. Now, what I propose to do in this Opening Statement is to outline briefly the evidence to be given in connection with the Leader’s Allowance account, Feltrim or Minmet, and the operation of Celtic Helicopters. As soon as the material in relation to the Central Bank comes to hand, I anticipate being able to make a short Opening Statement in advance of the evidence to be given by the relevant Central Bank and any other witnesses due to give evidence on that topic. Firstly, I am going to deal with the Leader’s Allowance account. It will be recalled that the Leader’s Allowance account was operated at Allied Irish Banks at its 1 – 3 Lower Baggot Street branch. The account was kept in the name of Mr. Haughey, Mr. McSharry and Mr. Ahern, but, to a substantial degree, appears to have been under the day-to-day control of Mr. Haughey. I think, as has been already indicated, the Tribunal’s attention was first drawn to this account when it was discovered that a cheque drawn on the account in the sum of £25,000 was lodged to the account in Guinness & Mahon from which payments were made to the firm of Messrs Haughey Boland, as that firm was then known, for the purpose of operating Mr. Charles Haughey’s bill-paying service; the bill-paying service whereby Mr. Haughey’s day-to-day personal or domestic affairs were managed. A significant part of the Tribunal’s examination of this account focused on the operation of the account for the purpose of depositing funds contributed for the medical expenses of the late Mr. Brian Lenihan and the use of the account to draw cheques to discharge expenditure incurred in connection with meeting those expenses. The Tribunal also examined continuing activity on that account in the years following the use of the account in connection with Mr. Lenihan’s medical expenses. You will recall that Mr. Lenihan’s medical emergency, as it were, arose in 1989, and the initial collection of funds was made in that year. In examining continuing activity on the account in 1990 and in 1991, evidence at the Tribunal’s public sittings has shown that the Tribunal has succeeded in identifying the sources of a number of other lodgments to the account in those years over and above the official lodgments to the account from the Exchequer as part of the ordinary payment of the Party Leader’s Allowance. As part of the Tribunal’s continuing examination of that account, Allied Irish Banks were required to provide the Tribunal with copies of available records relating to the operation of the account. Most of this information was provided to the Tribunal some considerable time ago. However, very recently, further documentation concerning the operation of this account came to light and the bank, recognising its continuing obligation to furnish any such documentation to the Tribunal, brought to the attention of the Tribunal a copy of a cheque which appears to have been lodged to the account in February of 1991. What Allied Irish Banks have provided to the Tribunal are two photocopies, one of the front and the other of the reverse side of a cheque dated the 6th February, 1991, in the sum of £25,000 payable to Charles J. Haughey, Party Leader’s account. The cheque is drawn on Allied Irish Banks, 73 Clanbrassil Street, Dundalk, County Louth, on the account of Mr. Philip Monahan and Mrs. Mary Monahan. The reverse side of the cheque appears to have been endorsed by Mr. Charles Haughey. The cheque, as we saw a moment ago on the overhead projector, is signed by Mrs. Philip Monahan. Mr. Frank Lynch is the manager of Allied Irish Banks at its 1 – 3 Lower Baggot Street, Dublin, branch, and he has informed the Tribunal that, from the markings on this cheque, it would appear that the cheque was lodged to the Leader’s Allowance account on the 13th February of 1991. From an examination of the account statements and the identification numbers on the reverse side of this cheque, he has been able to tell the Tribunal that the cheque corresponds with a lodgment to the Leader’s Allowance account. This is a lodgment of £25,000 credited to the account on the 13th February of 1991 and he has been able to tell the Tribunal that this represents the proceeds of the cheque drawn on Mr. and Mrs. Monahan’s account. And I think the record of that particular credit to the account has just been highlighted on the overhead projector. It’s credited to the account on the 13th February, 1991. On the same date, there are two drawings on the account; one for £945.66 and one for £12,914.50, and the second is a drawing I’ll come back to at a later point in this Opening Statement. When the cheque was drawn to Mr. Monahan’s attention, he provided the Tribunal with an account of the circumstances in which he was requested to make this sum of £25,000 available in 1991. The individuals involved in obtaining this payment from Mr. Monahan were Mr. Roy Donovan and Mr. Paul Kavanagh. From evidence already given to the Tribunal, it will be aware that Mr. Kavanagh was associated with fundraising on behalf of the Fianna Fail Party over a considerable period of time. He has informed the Tribunal that the payment was made in connection with the medical expenses of the late Mr. Brian Lenihan. Mr. Donovan has also been involved in fundraising on behalf of the Fianna Fail Party for some years and he has informed the Tribunal that sometime in late January/early February of 1991 he was contacted by Mr. Paul Kavanagh. Mr. Donovan has informed the Tribunal that Mr. Kavanagh came to him in a bit of a panic, indicating that the public had no idea of Mr. Haughey’s generosity and that Mr. Haughey was funding all of Mr. Lenihan’s medical expenses, but that, notwithstanding Mr. Haughey’s efforts, a further £50,000 was required as the medical bills were continuing to come in. Mr. Donovan did not form the impression that Mr. Haughey himself was paying for these bills out of his own funds but what was being conveyed was that Mr. Haughey was putting a significant effort into collecting funds for the purpose of discharging those expenses. Mr. Kavanagh indicated to Mr. Donovan that he, that is Mr. Kavanagh, had exhausted his usual sources of funds in particular, as this was just after the Presidential Election of 1990 and he inquired whether Mr. Donovan could open any doors for him using his own contacts. Mr. Donovan indicated to Mr. Kavanagh that he thought that Mr. Philip Monahan could be a source of funds and he undertook to arrange a meeting between Mr. Monahan and Mr. Kavanagh. Mr. Kavanagh recalls the approach he made to Mr. Donovan and he recalls informing Mr. Donovan that Mr. Haughey needed to raise a further £50,000 to meet Mr. Lenihan’s medical expenses. Now, it will be recalled that Mr. Kavanagh has already given evidence to the Tribunal concerning his role in collecting funds for the purpose of discharging Mr. Lenihan’s medical expenses and, while he has informed the Tribunal that he does not actually remember Mr. Haughey requesting him to raise these additional funds, he believes that Mr. Haughey must have requested him to raise this additional sum of £50,000 to meet continuing expenses. Now, in order to put this additional fundraising initiative in context, it should be recalled that, from the evidence already given to the Tribunal, it would appear that most of the expenses incurred by the late Mr. Lenihan were discharged in 1989 and in early 1990, I think up to, in or about March of 1990 from two sources, firstly, from the VHI by way of substantial ex gratia payment; and secondly, from the funds collected by Mr. Kavanagh and by the late Mr. Hanley in mid-1989. In fact, you will recall, Sir, that most of the funds were collected around the time of the June 1989 general election. Evidence has also been given to the Tribunal that by this time, by February of 1991, there appeared to be only one outstanding expense to be met in respect of Mr. Lenihan’s treatment. This was a bill in the sum of £12,914.50. This bill had been paid by the Department of Defence who had been seeking reimbursement for some time. It appears to have been in relation to travelling expenses incurred by the Department on behalf of Mr. Lenihan at a time when he was a serving minister. Now, if we could go back to the Leader’s Allowance account and if you look at the account bank statement, you will see, as I said a moment ago, that a cheque for this amount of £12,914.50 was, in fact, drawn on the account on the 13th February of 1991, the same day that the £25,000 from Mr. Monahan was credited to the account. From the Tribunal’s examination of the account and from the evidence which has been heard at the Tribunal’s public sittings, it would appear that there were no other disbursements from the Party Leader’s account after that date in respect of any expenses incurred by Mr. Lenihan. Now, in fairness to Mr. Kavanagh, I should say that he has informed the Tribunal that his role in connection with the late Mr. Lenihan’s medical expenses was limited to collecting funds, and, as he had no role in deploying those funds in the discharge of Mr. Lenihan’s expenses, he had no way of knowing how much was needed at any one time to pay for those expenses or any way of knowing how much had actually been paid in discharge of those expenses. It’s on this basis that he believes that he must have been asked by Mr. Haughey to collect a further £50,000. Mr. Kavanagh has informed the Tribunal that he had a meeting with Mr. Donovan, he believes, in the Shelbourne Hotel, and shortly after this meeting, presumably as a result of contact between Mr. Donovan and Mr. Monahan, Mr. Kavanagh had a meeting with Mr. Monahan and he believes that this may have occurred in Mr. Monahan’s offices in Harcourt Street. Following this meeting, he then arranged to collect a cheque from Mr. Monahan at Mr. Monahan’s own home in Castleknock. He assumes that, in accordance with his previous practice where the collection of funds for Mr. Lenihan was concerned, he would have given the cheque to Ms. Eileen Foy. He has also informed the Tribunal that the words “Charles Haughey (Party Leader’s Fund)”, which are on the payee line of the cheque, are in his handwriting and he has informed the Tribunal that the rest of the handwriting was inserted on the cheque by Mr. Philip Monahan. Mr. Monahan has informed the Tribunal that it was Mr. Roy Donovan who first approached him to make a payment, that he was informed by Mr. Donovan that the Fianna Fail Party required funds. Mr. Monahan has stated that he was not informed that the funds were being collected for Mr. Brian Lenihan. Mr. Roy Donovan has stated that he cannot recall whether he mentioned to Mr. Donovan what was behind his request for funds. I should say that Mr. Kavanagh, in his account of the circumstances in which he ultimately approached Mr. Monahan, has a clear recollection that he explained to Mr. Monahan that these funds were being collected for the late Mr. Brian Lenihan and that it was this reason that the cheque was made payable to the Party Leader’s Fund which was, as we know from earlier evidence, the account Mr. Kavanagh would have believed was being used as a collection point in which to deposit funds for Mr. Lenihan. Mr. Monahan agrees that the payee of the cheque was left blank and that the words “Charles Haughey (Party Leader’s Fund)” are not in his handwriting but that the rest of the cheque is in his handwriting. He also stated that he understood that the cheque would be made payable to the Party Leader’s Fund. Mr. Donovan recalls that sometime after he had made the arrangement for Mr. Kavanagh to meet with Mr. Monahan, he again spoke with Mr. Kavanagh and that he was informed by Mr. Kavanagh that Mr. Kavanagh had received £25,000 from Mr. Monahan, but that he had not obtained the full £50,000 that he was looking for. Mr. Kavanagh has no recollection whether he collected any further funds to make up his original £50,000 target. Now, I am going to pass on to give an outline of the evidence that will be given in relation to Feltrim/Minmet. You may recall that evidence was given last May in relation to the incorporation and flotation of Feltrim Mining plc, a company of which Mr. Conor Haughey was managing director from the incorporation of the company to mid-1993. Mr. James Stafford was mentioned in the evidence of Mr. Conor Haughey, Mr. Bernard Cahill (former Chairman of Feltrim Mining plc); Mr. Emmet O’Connell and Mr. Trevor Watkins. It appears that Mr. James Stafford was the first person approached by Mr. Conor Haughey with the idea of incorporating a publicly quoted mining company. Mr. Stafford, it appears, assisted in the preparation of a prospectus and initiated the involvement of Mr. Emmet O’Connell and Davys Stockbrokers. It also appears that Mr. Stafford advised Mr. Conor Haughey in relation to issues which arose in the early years of the company’s operation. Mr. Conor Haughey has informed the Tribunal in evidence that Mr. Stafford provided £40,000 towards the costs of the promotion of the company and that these funds were subsequently repaid after the flotation. Mr. Conor Haughey has also stated that Mr. Stafford agreed to invest £100,000 in the company. The Tribunal will wish to pursue its inquiries into Mr. Stafford’s involvement with Feltrim and, in particular, into the matters which prompted his interest in the company in the first instance. The last item I want to mention is Celtic Helicopters. Evidence has already been given to the Tribunal by Mr. Joe Malone concerning his involvement in Celtic Helicopters. In particular, it will be recalled that he gave evidence to the Tribunal that in or around 1984 or 1985, Mr. Haughey approached him and asked him to consider becoming Chairman of a new Helicopter company that Mr. Haughey’s son, Ciaran Haughey, was setting up at the time. Mr. Malone gave evidence that, in view of his then position as a director of Aer Lingus, he declined the invitation because of what he felt was a possible perceived conflict of interest. He also informed the Tribunal that, sometime later, a further discussion took place with Mr. Haughey concerning Celtic Helicopters. This was at Abbeville, Kinsealy. It was on a social occasion. On that occasion, Mr. Charles Haughey invited Mr. Malone to become an investor in the new company. Mr. Malone agreed to invest £15,000 in the company but specified that the investment was to be in the name of his son, Joseph junior. Mr. Malone has also given evidence that the matter was drawn up with him on a third occasion in 1991 and 1992 and that, on that occasion, he made no additional investment. It is in relation to the second occasion on which the matter was mentioned that he has now provided the Tribunal with further information, in the first instance in the form of an affidavit. This is because Mr. Malone is out of the jurisdiction in the United States. He has informed the Tribunal that he was accompanied to Abbeville on that second occasion by the late Mr. P.V. Doyle. He has indicated that while it was suggested to him that he might like to consider investing in Celtic Helicopters, he cannot say whether the late Mr. P.V. Doyle was also invited or whether any other person was invited to invest in Celtic Helicopters at that time. He says that it was during his return to the City after he had left Abbeville that he and Mr. Doyle discussed the merits or otherwise of making an investment in the name of Mr. Malone’s son. As it’s not envisaged that Mr. Malone will be called to give evidence during these sittings, though he may be required at a later date, I now propose to open his affidavit. And it should form, at this point, part of the record of the Tribunal, both the affidavit itself and the contents of it.